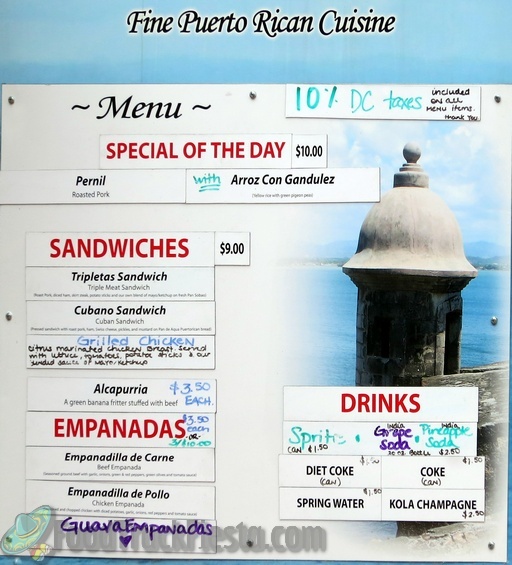 My husband is from Puerto Rico so when we were in town and saw they had a food truck we searched them out in the Navy Ship Yard and had a great meal that reminded us of Puerto Rico. It was yummy!! The food and service was great! A update to my previous post - awesome! I finally got to try the Tripletas (vs stealing some from a friend)...my oh my does not being to describe it. A excellent combination of grilled roasted pork, steak and ham stuffed into a roll, potato sticks on top. Every bit the WOW factor I thought after my initial taste. A huge sandwich, after the first bite you just don't want to stop. Yes, it is that good. Tried this truck for the first time today, very pleased. Exceptionally friendly, and fast service the Cuban was great. Roasted pork, ham, turkey with mustard and pickles on a nicely toasted pressed roll. A tad on the pricey side at $9.50 though I would get it again. However, THE sandwich to get is the Tripletas. With grilled roasted pork, steak, and ham stuffed into roll and topped with potato sticks. While also $9.50 it is a HUGE sandwich and has that WOW factor. As someone from Puerto Rico, I have very high expectations for Puerto Rican food. However, this truck went absolutely above my expectations. First off, I recieved my food quickly despite the very long line. The customer service was impeccable, and I felt appreciated as a customer. The food itself was delicious. I ordered the fricasse pollo which comes with white rice, chicken, and potatoes. It was perfectly seasoned, not at all greasy. The chicken was so moist and tender it feel apart when I used my fork. The rice was perfectly cooked, which is a good sign! I've been trying to eat at a different food truck a few times a week, and none have come close to this. It's my new fave! My second trip there and my second review. Today the special was Pernil, a marinated roast pork dish served with fried plantains and rice with pigeon peas. Once again, I was scraping the plate. The pork was tender and juicy; well-seasoned but not salty. Plantains were fried perfectly and the rice and pigeon peas were plentiful and delicious. A ton of food for $10. Please come back to L'Enfant soon. I can't wait to try another of your creations. Today was my first time ever experiencing Puerto Rican food and I hope you will come back soon so I can try some of your other dishes. The pinon was an lovely melding of sweet from the plaintains and savory with the ground beef. For $10 I got enough food for two meals. You definitely get your money's worth with this dish. 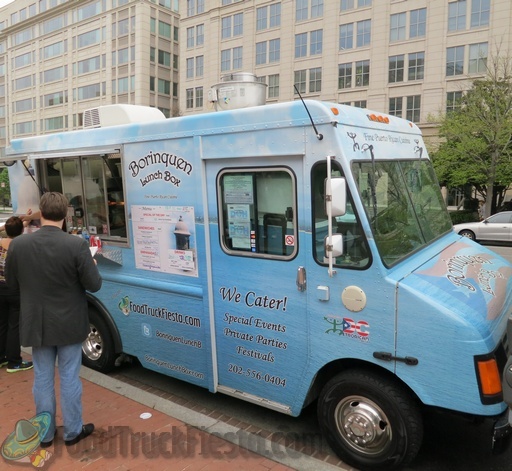 Borinquin gets some points for a big presentation and nice music, but a long wait for mediocre food which consisted mostly of rice, a few small pieces of chicken and soggy plantains earns this over-priced lunch truck a generous C-. The food was amazing. Exactly what we were hoping for it to taste like. 110% authentic Puerto Rican food. So glad we found out about you guys. We will definitely find you again. The pinon (pronounced pignon) is a savory dish that is a meal in itself. It is put together like a lasagna, with layers of ripe plantains and minced seasoned beef topped with cheese. It was very good, and a good-sized serving too. The plantains were very ripe, as they should be, which makes them sweet and soft. The other food looked good to, and the kitchen area looked very clean, so I'm going to keep trying them. The owner of Borinquen Lunch Box relocated from Florida to DC and planned his food truck concept for over 8 months. This truck serves Puerto Rican cuisine, from the typical sandwiches (Tripletas, Churrascos, Media Noches) to soups (Sancocho, chicken and rice stew) Mofongo, to empanadillas and more. The truck officially launched on February 2, 2012.